We’d love your help. Let us know what’s wrong with this preview of Read and Gone by Allison Brook. A devoted dad is as precious as diamonds, but Carrie Singleton wouldn't know since her dad Jim's been on the lam most of her life. In an unusual family reunion, she finds Jim breaking into her cottage in the middle o Seven-million dollars' worth of missing gems bring Carrie Singleton's long-lost and larcenous dad back into her life and it's up to Carrie to clear his name. To ask other readers questions about Read and Gone, please sign up. Even though I promised myself I wouldn't go on NetGalley, I did... then I requested a few books... then I was awarded said books... and now my 'ready to read on the shelf' TBR is back around 25! So... I started with NetGalley reads this weekend, choosing a new author and a book series I'd not read before: The Haunted Library Mysteries by Allison Brook. I even read the second book, Read and Gone, before the debut of the series since I don't have that one in my possession. I can safely say that I Even though I promised myself I wouldn't go on NetGalley, I did... then I requested a few books... then I was awarded said books... and now my 'ready to read on the shelf' TBR is back around 25! So... I started with NetGalley reads this weekend, choosing a new author and a book series I'd not read before: The Haunted Library Mysteries by Allison Brook. I even read the second book, Read and Gone, before the debut of the series since I don't have that one in my possession. I can safely say that I will go back to read the first book and continue reading the whole series. In this cozy caper, Carrie Singleton is celebrating Christmas with her family and new boyfriend, Dylan. After everyone leaves, Carrie's thief father shows up asking for help. Before she knows it, a frustrated and angry Carrie agrees to help him in between her duties running one of the departments in the local library. As the story unfolds, her father Jim's former partner is found murdered, and Carrie is stuck trying to prove her father isn't a killer. Add in a few more bodies, and a second mystery at the local senior care facility, and Carrie is quite busy. It's all connected, but she's not sure how. In the end, she solves the crime and figures out how to move forward. At first, the story felt a little too stiff and formulaic, but by 10% it settled in with a really positive and engaging flow. The ghost of a friend's dead aunt watches over the place, but really doesn't provide many clues thus far -- it's just an other-worldly presence for some humor. Carrie also struggles in her relationship with Dylan, whose job forces him to play on opposite sides for part of the story. There are lots of suspects, several side-stories, and a welcome amount of refreshing honesty about private citizens acting as detectives. Carrie pushes the limit, but she's also clearly showing us why she has to. It's believable. 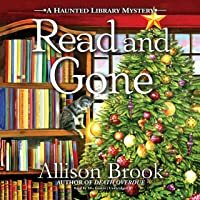 Read and Gone by Allison Brook is the second book of the paranormal cozy The Haunted Library Mysteries series. Each book in the series contains it’s own mystery to be solved and could be read as a standalone. The series does however carry over character details from book to book so is best enjoyed as a whole. Read and Gone begins with the main character, Carrie Singleton, celebrating the holidays with her new friends she’s made in her job as the library event coordinator. When the party is over h Read and Gone by Allison Brook is the second book of the paranormal cozy The Haunted Library Mysteries series. Each book in the series contains it’s own mystery to be solved and could be read as a standalone. The series does however carry over character details from book to book so is best enjoyed as a whole. 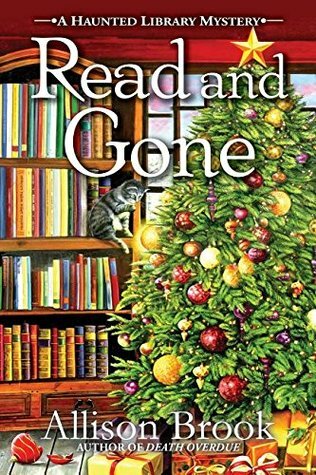 Read and Gone begins with the main character, Carrie Singleton, celebrating the holidays with her new friends she’s made in her job as the library event coordinator. When the party is over however Carrie is awakened as her long lost felon of a father breaks into Carrie’s life again in more ways than one thus giving me the push to rename this one Daddy Issues. Dear old dad, Jim, has returned to ask his daughter for her help in finding out what happened to his share of a former heist. Of course Carrie turns him away only to end up with her father in jail for suspicion of murder in which she’s certain he’s innocent of. Carrie ends up investigating the missing gems and trying to catch the murderer which brings turmoil into her new safe life. With this second installment of the series my rating has slid back a little from 3.5 stars to only 3 this go round. I’m still a bit disappointed that the resident ghost doesn’t stand out more but rather just blends in with the other characters. And with this go round we had relationship angst that I’m not a fan of in romantic books where it belongs let alone a cozy. But really the story just seems a bit bland and lacking any cozy quirkiness that would make me really love them and instead are just OK reads to me instead. I tend to easily pick up any book that has the words book, read or library in the title. This one said haunted as well so it was a definite must read for me. Read and Gone turned out to be the second in a series but I did not find that a problem. This is a cosy mystery and as such it is an easy, entertaining read. It stays true to the genre - there are a number of corpses, lots and lots of characters and the main character goes where she should not but always survives to tell the tale. There is I tend to easily pick up any book that has the words book, read or library in the title. This one said haunted as well so it was a definite must read for me. Read and Gone turned out to be the second in a series but I did not find that a problem. This is a cosy mystery and as such it is an easy, entertaining read. It stays true to the genre - there are a number of corpses, lots and lots of characters and the main character goes where she should not but always survives to tell the tale. There is also the requisite overly intelligent cat. The story moves along well despite frequent descriptions of meals and bathroom breaks (both the MC's and the cat's). I actually started to worry about the amount the cat was eating. He will be a total fur ball by book 3. I was disappointed too by the haunting or rather the lack of it. There is a ghost but she is very tame and barely has a role in the book. Read and Gone is the second cozy mystery in the Haunted Library Mystery series. Carrie Singleton is the head of programs and events at the Clover Ridge, CT library. She loves her job, even though the library comes with a special guest...the ghost of a former librarian, Evelyn. In this second mystery, Carrie is gearing up for the holiday season at the library, when her long-lost father shows up, begging her to help him. Jim Singleton is a crook and Carrie hasn't seen him in years. He tells a tale Read and Gone is the second cozy mystery in the Haunted Library Mystery series. Carrie Singleton is the head of programs and events at the Clover Ridge, CT library. She loves her job, even though the library comes with a special guest...the ghost of a former librarian, Evelyn. In this second mystery, Carrie is gearing up for the holiday season at the library, when her long-lost father shows up, begging her to help him. Jim Singleton is a crook and Carrie hasn't seen him in years. He tells a tale of a jewelry heist gone wrong and the local jeweler who refuses to give him his share of the take. Soon after, the jeweler is found murdered. Is her father a crook and a murderer? Or....is a dangerous criminal hanging around hoping to get the jewels they stole? Smokey Joe awakens Carrie Singleton from sleep letting her know that there is an intruder in the house. The prowler turns out to be her Dad, Jim who has been missing most of Carrie's life. He tells her looking for a fortune diamonds that his partner jeweler, Benton has his share. Jim is found looking in the store where Benton lies murder and is arrested for the killing. The twist and turns the tale takes will hold you enthralled as Carrie works to find out who the murderer is while Smokey Joe's Smokey Joe awakens Carrie Singleton from sleep letting her know that there is an intruder in the house. The prowler turns out to be her Dad, Jim who has been missing most of Carrie's life. He tells her looking for a fortune diamonds that his partner jeweler, Benton has his share. Jim is found looking in the store where Benton lies murder and is arrested for the killing. The twist and turns the tale takes will hold you enthralled as Carrie works to find out who the murderer is while Smokey Joe's chases mice through the library in the 2nd installment of the haunted library series. The ending will surprise you. I highly recommend this book and series. This is the second book of the series, and even though I haven’t read the first part, I was able to follow this book quite easily. There are a few references to the past and you can quickly realise what happened. Though, if you wish to read the series, don’t start with #2, because there are a few spoilers here that you wish you hadn’t read if you read book #1. I won’t be reading #1 because the spoilers in this book ruined it for me. But I am sure it’s an amazing story as well. I like the library atmosphere setting, and the ghost. I, personally, would have enjoyed the story more if the protagonist hadn’t allowed herself to be manipulated by her father and a couple other people suspected of murder, but other aspects of the story made it an appealing read. Read and Gone is the second book in the Haunted Library Mystery series and it was a just as wonderfully told story as the first book. Again, Evelyn, the library ghost, has only a small part in it. I do like that since I am not big on paranormal stuff but it is definitely a fun element here and I don't mind it. I loved the Christmas feel of the story and it went very well with other elements in this book like the newly developing relationship between Carrie and her Dad. It was great to meet Carrie' Read and Gone is the second book in the Haunted Library Mystery series and it was a just as wonderfully told story as the first book. Again, Evelyn, the library ghost, has only a small part in it. I do like that since I am not big on paranormal stuff but it is definitely a fun element here and I don't mind it. It was great to meet Carrie's father Jim, the professional thief, who is coming to town to hook up with a fellow criminal to pick up his share of stolen diamonds. When this man is killed in his store Jim becomes the main suspect and a lot of people are trying to find the missing diamonds....or are they just a myth? I requested this book from NetGalley and am thankful that Crooked Lane Books and the author provided me with an advance copy. Carrie Singleton is settling into her life in Clover Ridge with her library friends and her relationship with Dylan. But then her thieving con-artist father, Jim appears on her doorstep and she finds herself in the awkward position of defending her father while trying to hold onto another precious relationship. Meanwhile, most of the characters in the book are searching for the missing valuable gems they all think were in the possession of the late jeweler, Benton Parr when he was murdered. I rea Carrie Singleton is settling into her life in Clover Ridge with her library friends and her relationship with Dylan. But then her thieving con-artist father, Jim appears on her doorstep and she finds herself in the awkward position of defending her father while trying to hold onto another precious relationship. Meanwhile, most of the characters in the book are searching for the missing valuable gems they all think were in the possession of the late jeweler, Benton Parr when he was murdered. I really enjoyed this book. The pace was just right; just when I thought I knew who had the gems and might be the killer, the chase was on again. There were multiple viable suspects, each having plausible motives. Carrie's cat, Smoky Joe, plays a special role in the book, and instinctively knows how to provide comfort to people of all ages. However, the book lacks the haunted element in that Evelyn the apparition makes few appearances. Overall, this is a really fun and engaging read. *** Thanks to NetGalley for a complimentary ARC of this book. My review is voluntary. Read and Gone was another enjoyable cozy from Allison Brooks and the perfect book to get you into the holiday spirit. After a joint celebration for her birthday and housewarming, Carrie Singleton hopes to get a good night’s rest before she needs to gear up for all of the holiday programming at the library. To her dismay, her thief father appears in the middle of the night asking for Carrie’s help in locating his share of seven-million dollars’ worth of missing gems. When she refuses, he takes off Read and Gone was another enjoyable cozy from Allison Brooks and the perfect book to get you into the holiday spirit. After a joint celebration for her birthday and housewarming, Carrie Singleton hopes to get a good night’s rest before she needs to gear up for all of the holiday programming at the library. To her dismay, her thief father appears in the middle of the night asking for Carrie’s help in locating his share of seven-million dollars’ worth of missing gems. When she refuses, he takes off only to call her when he’s accused of murdering Benton Parr, his accomplice in the gem theft. Determined to find the missing gems herself and clear her father’s name, Carrie begins her investigation only to find herself in the path of a killer who will do anything to find the gems first. I enjoyed the mystery plot in Read and Gone quite a bit and think it was the best aspect of the book. The mystery surrounding the missing gems was interesting and millions of dollars worth of stolen gems certainly tempted a lot of people to get involved in finding them. I do wish we had learned more about how the gems were stolen though as that bit was never actually covered. Once we learn the killer’s motive, it made sense who the person was even if they weren’t at the top of my list of suspects. Carrie did a bit of backsliding in terms of character development compared to the last book but she eventually got back on track towards the final third of the book. I think my issue with her was that she was a bit wishy-washy this time around and would sometimes change her mind three or four times on the same page. There was also a decent amount of relationship drama with her boyfriend Dylan, an insurance investigator looking for the gems, that I wasn’t expecting in a cozy. One of the great things about the books in this series is the large cast of enjoyable side characters. I was happy to see more of Carrie’s aunt and uncle as she has a great parent-child relationship with them. Carrie’s friends at the library continue to provide a lot of entertainment and I enjoyed their helping Carrie solve the mystery. Evelyn, the library’s resident ghost returns to provide some Carrie with some great advice as well as some cryptic comments regarding the case. Smokey Joe, the library cat, makes quite a few appearances and continues to be as adorable as ever. Overall Read and Gone was a fun, quick read and it’s clear The Haunted Library Mysteries books are shaping up to be a solid cozy mystery series. I definitely recommend these books for fans of book-centric cozies. Things are finally going well for Carrie Singleton. She has a new job at the library, a new boyfriend, Dylan, and even a devoted cat named Smokey Joe. Smokey Joe has become the resident library cat and is a hit with all the local patrons in the small town of Clover Ridge, Connecticut. In fact, for the first time in her life, she feels a part of a family. It’s Christmas time in Clover Ridge when someone breaks into Carrie’s house. Suddenly she’s not feeling so safe anymore. She’s even more stunned Things are finally going well for Carrie Singleton. She has a new job at the library, a new boyfriend, Dylan, and even a devoted cat named Smokey Joe. Smokey Joe has become the resident library cat and is a hit with all the local patrons in the small town of Clover Ridge, Connecticut. In fact, for the first time in her life, she feels a part of a family. It’s Christmas time in Clover Ridge when someone breaks into Carrie’s house. Suddenly she’s not feeling so safe anymore. She’s even more stunned when she learns the man who broke in is her estranged father. A man who has shown no interest in her life since she was a child. Now he’s back and asking for a favor. Not a small favor, but a huge one. He had been involved in a gem heist, worth in the multi-million dollar range, and his heist partner is hiding the gems. He wants Carrie to help find the stolen goods. Then, her father’s partner turns up murdered and her father is the prime suspect. He may not be perfect but Carrie doesn’t believe he’s a killer. She’s determined to find the real killer and the gems as well. When she learns her new boyfriend is actually an investigator hired to find the gems, she’s hurt and confused. She vows to prove her father’s innocence and make everything right. Read and Gone is the second book in the Haunted Library series. If you haven’t read the first one, there’s plenty of background information throughout this one. The characters are well rounded - both the main and secondary characters are vividly portrayed. I found myself really caring about Carrie and her family, especially Smokey Joe - cat lover that I am :) There’s a resident ghost in attendance but she’s not a huge part of the story. She does add a bit of charm to the series, though. The author does an amazing job of bringing this small town to life. It was a quick read for me. The storyline is filled with mystery, adventure and romance mixed into one captivating read. The ending took me by surprise. I hope there will be more books in this series. Carrie's father is a thief. He shows up in the middle of the night, and wants her to help him recover his portion of the gems from a heist he did with a local jeweler. She refuses to help, but when the jeweler is murdered, and her dad is arrested, Carrie gets involved. She knows her father to be a thief, but not a killer, so she wants to clear his name. To complicate matters, it turns out Carrie's boyfriend is an insurance investigator, and he's looking for the stolen gems, too. The 2nd book in Carrie's father is a thief. He shows up in the middle of the night, and wants her to help him recover his portion of the gems from a heist he did with a local jeweler. She refuses to help, but when the jeweler is murdered, and her dad is arrested, Carrie gets involved. She knows her father to be a thief, but not a killer, so she wants to clear his name. To complicate matters, it turns out Carrie's boyfriend is an insurance investigator, and he's looking for the stolen gems, too. The 2nd book in The Haunted Library mystery series. This book doesn't have much about the haunted library. I haven't read the first book in the series, so I'm guessing that one features more of the library ghost. This 2nd book was good as a standalone. As a book lover, how could I not enjoy a series that is set in a library and is haunted too?! Ok, so the haunting isn't a scary haunting, but that is ok because Evelyn, the ghost, is caring and comical at the same time. Family means a lot to Carrie and she was quite surprised when her father, Jim, showed up. Who could blame her since he wasn't around much and he is a thief? I could see where it might be hard to have him around but at the same time want him around because he is family. I did like As a book lover, how could I not enjoy a series that is set in a library and is haunted too?! Ok, so the haunting isn't a scary haunting, but that is ok because Evelyn, the ghost, is caring and comical at the same time. Family means a lot to Carrie and she was quite surprised when her father, Jim, showed up. Who could blame her since he wasn't around much and he is a thief? I could see where it might be hard to have him around but at the same time want him around because he is family. I did like watching the progression of their relationship in this book. So the big mystery is what happened to $7+ million in gems that were stolen by Jim and the local jeweler, Benton. Of course being a mystery somebody has to end of dead and Benton is the victim. But where are the gemstones? Carrie, of course, gets involved in this case. I'm not sure she would have if her dad wasn't involved and wanting to find the gems, but not to turn them in and collect the reward but to fence them. The author throws quite a few characters into the mix as suspects and when the real killer is revealed I was surprised. This person wasn't really on my radar! I thought this character could be the culprit but they were near the bottom of the list. I thought the mystery was well written. Then there is the romance part of the story. Here is where Carrie got on my nerves a little bit. She started thinking different things about Dylan and why he was involved with her and perhaps he only wanted to use her to get to her dad. I thought it was kind of crazy for her to think this and why didn't she talk to him about her thoughts? I didn't remember that Dylan was in the insurance business but it has been a bit since I had read the first book. After reading the first book in the Haunted Library Mysteries, DEATH OVERDUE, I was ready to move on to the next book in the series. Well, it took a year of waiting, but finally I got to read, READ AND GONE. And once I started reading, it was no time at all before is was read and gone 😉. It so was completely worth the wait. It was great to be back in Clover Ridge with protagonist, Carrie Singleton, her aunt and uncle (I adore them), and of course Smokey Joe, and resident library ghost, Evelyn. Au After reading the first book in the Haunted Library Mysteries, DEATH OVERDUE, I was ready to move on to the next book in the series. Well, it took a year of waiting, but finally I got to read, READ AND GONE. And once I started reading, it was no time at all before is was read and gone 😉. It so was completely worth the wait. It was great to be back in Clover Ridge with protagonist, Carrie Singleton, her aunt and uncle (I adore them), and of course Smokey Joe, and resident library ghost, Evelyn. Author Allison Brook brings such life to her characters, that I feel like a truly know them. As for the story, mystery, mayhem, and murders (yes, plural! ), as well as family drama is what you’ll find between the covers of READ AND GONE. A wonderful whodunit with so many surprises I found myself catching my breath on more than one occasion. Ms. Brook had me on the edge of my recliner by the last couple of chapters. READ AND GONE has something for everyone who loves a good mystery. Why not check it out for yourself? Read and Gone by Allison Brook is the second book in Ms. Brook's Haunted Library series. This book can easily stand alone as most of the characters are re-introduced in this book. The plot is smoothly paced with a few twists to keep the reader guessing as the murder victims begin to increase as the hunt for several million dollars in stolen jewels becomes more well known throughout the town. The relationships in this one was very complex as Carrie's estranged father returns and causes rifts betwe Read and Gone by Allison Brook is the second book in Ms. Brook's Haunted Library series. This book can easily stand alone as most of the characters are re-introduced in this book. The plot is smoothly paced with a few twists to keep the reader guessing as the murder victims begin to increase as the hunt for several million dollars in stolen jewels becomes more well known throughout the town. The relationships in this one was very complex as Carrie's estranged father returns and causes rifts between her and her boyfriend, Dylan. Then there are the relationships between the Parr family members which show the family to be equally dysfunctional as Carrie's family. There was a scene in the book in which I thought Carrie went off the rails while talking to a couple of suspects which I didn't think really added anything to the plot. It seemed like it was there more to add drama than to move the story along. I was disappointed that the ghost, Evelyn, was only in a couple of scenes in this book. She added so much insight into the first book in this series and I had hoped she would be there for Carrie in this one, too. All in all, it was an easy cozy mystery to read in an afternoon. This is a Cozy Mystery, with way too many employees in a Library in a small city of twenty thousand. Doesn't anyone own a Tablet? It is slow going, a lot of self pity on the part of Carrie. Her father shows up after years of being gone, to jail, was one of the places. He is looking for a fortune of lost gems, he stole with a friend, who still lives in town, and owns of all things, a jewelry store! Her Aunt, and Uncle are precious, and deserve better from her. There is not enough romance between This is a Cozy Mystery, with way too many employees in a Library in a small city of twenty thousand. Doesn't anyone own a Tablet? It is slow going, a lot of self pity on the part of Carrie. Her father shows up after years of being gone, to jail, was one of the places. He is looking for a fortune of lost gems, he stole with a friend, who still lives in town, and owns of all things, a jewelry store! Her Aunt, and Uncle are precious, and deserve better from her. There is not enough romance between her boyfriend Dylan, and herself. I have no clue, what either one looks like? This could have been a really good book, however, the ball was dropped somewhere. Carrie has a wonderful job as head of Programs and Events at her local library. She has a loving and caring aunt and uncle and an adorable cat. She also has a absent father who has returned home to ask Carrie for help locating stolen gems (he had a big part in the gems being stolen). Just what every daughter wants, to help her dad finish pulling off his crime, especially when she has not seen him in a long time. She will have to decide if she wants to help him or not, and also figure out who has gone a a killing spree. The characters are well rounded and well developed. The relationship between her and her aunt and uncle is special and you can tell how much they love each other. She has some good friends that she works with and she has a resident library ghost, Evelyn, that she talks to whenever the ghost appears. I do wish that Evelyn would have had a bigger part in this book, like she did in book one. Hopefully she will be more active in the next book. The writing style flows smoothly and the book is an easy read. The author is very talented in her descriptive writing without getting to wordy. The mystery was well plotted and was carried on well throughout the entire book. With numerous killings and twists and turns, it was not an easy mystery to solve. I would recommend this book to anyone who enjoys a well crafted cozy mystery. I have read both books in this series and I enjoyed both of them. Another fun Haunted Library Mystery! I read this book quickly and it was as enjoyable as the first in the series. The main character, Carrie, has such a fun job! She gets to oversee events at the library, take her adorable cat with her to work, and now and then hangs out with a ghost! The ghost is Evelyn, a former library staff member, who gives her advice and is just someone really nice to talk to. I thought she played a bigger role in the last book but she was still a great addition to the stor Another fun Haunted Library Mystery! I read this book quickly and it was as enjoyable as the first in the series. The main character, Carrie, has such a fun job! She gets to oversee events at the library, take her adorable cat with her to work, and now and then hangs out with a ghost! The ghost is Evelyn, a former library staff member, who gives her advice and is just someone really nice to talk to. I thought she played a bigger role in the last book but she was still a great addition to the story, especially when she gives advice on how to handle Carrie's nemesis (who happens to be Evelyn's crotchety niece)! All in all it was a well planned mystery and it will appeal to anyone who loves cozy mysteries set a Christmas time. I am eager to read the next in the series. I voluntarily read and reviewed this book via NetGalley. Read and Gone by Allison Brook is the second novel in A Haunted Library Mystery series. Carrie Singleton is the head of Programs and Events at Clover Ridge Public Library and has settled into her new life quite nicely. Tired after hosting a combination birthday and housewarming party, Carrie drifts off to sleep. She is awakened in the middle of the night when someone breaks into her cottage. It turns out to be her estranged father, Jim Singleton. Jim has been gone most of Carrie’s life making a Read and Gone by Allison Brook is the second novel in A Haunted Library Mystery series. Carrie Singleton is the head of Programs and Events at Clover Ridge Public Library and has settled into her new life quite nicely. Tired after hosting a combination birthday and housewarming party, Carrie drifts off to sleep. She is awakened in the middle of the night when someone breaks into her cottage. It turns out to be her estranged father, Jim Singleton. Jim has been gone most of Carrie’s life making a living as a thief. He needs Carrie’s help in recovering his half of $7 million dollars in jewels from his last heist. His partner, local jeweler, Benton Parr is holding the goods and not responding to his queries. Carrie, of course, refuses and Jim disappears into the night. Benton Parr gives a lecture at the library that evening and the next morning Carrie receives a call from Lt. John Mathers. Benton Parr was found dead in his shop by an employee and Jim Singleton just happened to be there trying to get into the safe. Turns out that Carrie’s boyfriend, Dylan Avery is the insurance investigator tasked with tracking down the stolen gems (oh dear). Carrie sets out to find the gems and Benton Parr’s killer. Someone, though, is not happy with Carrie’s sleuthing and attempts to take her out of the game (they do not know Carrie very well). Will Carrie be able to wrap up the case before Christmas? Christmas. A library. And a main character named Carrie. Sign me up!! When you add in the cute ghost of the former head librarian, plus a library cat with personality and a supporting cast of friends, family, and not-so-friends, you’ve got a great recipe for a cozy mystery. In Read and Gone, the author takes us back to the Clover Ridge Public Library and this time we get even more insight into Carrie Singleton’s personal life. Particularly her relationship with her father Jim, a thief who shows up Christmas. A library. And a main character named Carrie. Sign me up!! In Read and Gone, the author takes us back to the Clover Ridge Public Library and this time we get even more insight into Carrie Singleton’s personal life. Particularly her relationship with her father Jim, a thief who shows up unexpectedly after years on the lam. There were a lot of dynamics going on with this part of the storyline – not the least of which was Carrie’s conflicting emotions around seeing her dad again (and being asked to help him recover his share of the gems he stole). I thought the author portrayed all of these dynamics really well – and authentically – while still in keeping with the tone of a cozy mystery. I didn’t care so much, however, for the up and down dramatics around Carrie’s relationship with Dylan. I understood her concerns the first time but after a bit I was just done with her fluctuating pity party about it lol. The mystery itself kept me guessing, and while I had my suspicions I wasn’t completely right – and it didn’t play out like I thought it would (which is a good thing!). There were a lot of different facets to this mystery as well – from the original gem heist (and where are they now?) to the murders that keep piling up to what exactly is Carrie’s dad up to now? I wish Evelyn Havers (the friendly resident library ghost) had played more of a role in this book, as far as the mystery goes, but I enjoyed the glimpses of her nonetheless. Bottom Line: A charming small town with a copious cast of characters, a small-town library with a surprisingly robust staff list, a feisty library cat with his own plans and plots, and the former head librarian who is haunting her old digs (whom only Carrie and her young cousin can see). Throw in a jewel heist, the missing gems, and a handful of murders and you’ve got yourself an entertaining cozy mystery! Brook’s library setting is every bibliophile’s dream, and Carrie is a very likable heroine. The mystery is well-plotted, and the characters are layered and intriguing. I’m already looking forward to book #3! Incredibly well written cozy mystery that is an absolute must read for fans of the genre. I was absolutely hooked from page one unable to put it down as the story unfolded. The relatable characters, fabulous setting, and elaborate mystery all combine into this incredible novel with a library theme. The cute kitty is just icing on the cake. I totally love this series so I give it 5/5 stars. A good book with a good mystery and story about growing, mending fences, and healing. A librarian, a cat and a town full of secrets where a lot of people are not what they seem. The mystery is well written, no plot hole and sometimes takes the backseat to the more human side side of the story: the one about family relationship, healing, accepting to love and to be loved. The cast of characters is really interesting and, even if there's a previous book, I had no problem in understanding their relati A good book with a good mystery and story about growing, mending fences, and healing. The cast of characters is really interesting and, even if there's a previous book, I had no problem in understanding their relationship and the ongoing developments. The paranormal element is not prominent, just another character in the cast. This is the second book in the Haunted Library Mysteries and a wonderful read. We have Carrie the librarian, a cat and some town secrets. Carries father has been away most of her life and jail was one place. With Carrie, her father and Dylan looking for the gems there is no telling what is going to happen. The mystery is great and keeps the reader on their toes. The ghost was more like another character and no really paranormal per say. The romance between Dylan and Carrie is really not much jus This is the second book in the Haunted Library Mysteries and a wonderful read. We have Carrie the librarian, a cat and some town secrets. Carries father has been away most of her life and jail was one place. The romance between Dylan and Carrie is really not much just a hint. Would like to see more there or have her find someone else. The author did a great job with the plot and kept enough humor to keep the story moving nicely. This was a much better story than the first in the series. It’s a bit of a stretch to call this series “haunted library”as the ghost plays such a very small part. A dedicated father is a precious thing, but Carrie Singleton wouldn’t know since her dad Jim’s been in and out of her life. In an unusual family reunion, she finds Jim breaking into her cottage in the middle of the night. The fun starts when he begs her to help him recover his half of a twenty-million-dollar gem heist he pulled off with a local jeweler, Benton Parr. Who ends up dead. Carrie finds her father behind bars for the recent murder of Benton Parr. Who made the connection? Unbeknownst to A dedicated father is a precious thing, but Carrie Singleton wouldn’t know since her dad Jim’s been in and out of her life. In an unusual family reunion, she finds Jim breaking into her cottage in the middle of the night. The fun starts when he begs her to help him recover his half of a twenty-million-dollar gem heist he pulled off with a local jeweler, Benton Parr. Who ends up dead. Carrie finds her father behind bars for the recent murder of Benton Parr. Who made the connection? Unbeknownst to her, Carrie’s boyfriend Dylan, an insurance investigator, has been searching for the gems. Determined to find the jewels herself, she starts examining every facet of Parr’s life. She turns up a treasure trove of suspects, one of whom knocks her over the head as she searches the victim’s cabin. Retreating to the quiet confines of the library where she works, Carrie watches as Smokey Joe, the resident cat, paws at a hole in the wall. Is he after the library’s ghost Evelyn, mice or something shinier? Read and Gone is a study in a dysfunctional family dynamic that for some reason, works. Oddly enough, even though Carrie’s father has been absent or in jail for most of her life, she still finds that she loves and cares for him. Odder still, it seems that Jim loves her as well. So why did he keep getting himself in trouble and disappearing from her life? The characters in this book/series are just beginning to develop, but they hold a great deal of promise. It is easy to like Carrie, and Jim, as well as some other reoccurring characters. Unfortunately, the ghost of the library does not play a significant part in this book, but hopefully, this will develop as well as the series goes on. Many of the characters have nice personalities and hopefully will be fleshed out more to make them memorable and identifiable for the reader. The setting is nice, and there is no need for detailed background information as this book can stand alone. However, a bit of background wouldn’t hurt in future books to enhance the enjoyment of the reader and to help the stories move along. A library is often used in this type of book. There are several very good cozies that are set in a library with a ghost. It is hoped that this series will be able to incorporate these elements without becoming too much like others of its kind. The resolution and the identity of the killer were not complex to figure out. There were plenty of clues and twist and turns to help the reader figure out who the killer was. For some readers, it may even be a bit too easy. There are many things in this book that a reader will find enjoyable. For that reason I am happy to recommend it to anyone who has a taste for books, murder, and a family that has issues but, in the end, still love each other. This review has been hidden because it contains spoilers. To view it, click here. Carrie Singleton's father, Jim, who had been absent most of her life, and makes his living as a thief, is back in search of his half of seven-million dollars worth of gems that he and a local jewelry, Benton Parr, stole. Jim asks for Carrie's help in finding the jewels so he can leave town. She refuses, and when his partner, Benton, is found dead, the local law think Carrie's father is the murderer. When he's released into her custody after being interrogated, he comes to her house and goes on an Carrie Singleton's father, Jim, who had been absent most of her life, and makes his living as a thief, is back in search of his half of seven-million dollars worth of gems that he and a local jewelry, Benton Parr, stole. Jim asks for Carrie's help in finding the jewels so he can leave town. She refuses, and when his partner, Benton, is found dead, the local law think Carrie's father is the murderer. When he's released into her custody after being interrogated, he comes to her house and goes on an errand, and ends up in the hospital. Thus starts an adventure where Carrie tries to find the gems, enjoy her job at the Clover Ridge Public Library, keep track of her cat, Smokey Joe, who is the library cat while Carrie is there, and deal with her developing relationship with Dylan, her insurance investigator boyfriend, who is also after the gems. On the minus side, I felt the author overused exclamation points, and that annoyed me the more the book went on. Someone was calling! Someone was at the door! It just seemed odd to me, and in the last third of the book when I saw an exclamation point I groaned. I also felt as if she responded to her problems with Dylan rather harshly. It could go back to her relationship with her father, who was gone for much of her life, but it still annoyed me. I would also have liked the ghost to play more of a role. She just seemed like a sidekick that appeared every once in a while. But I did love Smokey Joe. A library cat is a perfect character, and he played his part brilliantly. Overall though, I enjoyed the story. As I said, I like Carrie and I look forward to seeing her in future Haunted Library stories.